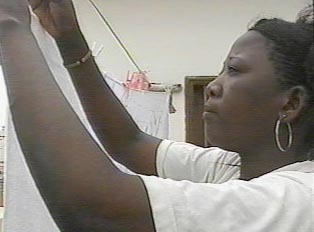 One can find laundromats and dry cleaners in Senegal, particularly in the city, but most Senegalese do their own laundry by hand at home. Although washing machines are slowly growing in popularity, they are highly impractical insofar as electricity is quite expensive. Many people still believe that the machine does not wash clothes as thoroughly as a person who washes them by hand. The process of washing clothes involves moving them from one to another of three or four buckets of water. After the wash is wrung out, it is hung in the sun to dry. Usually the wash is done in the morning in time to be hung during the sun’s warmest hours. If wash is done late in the afternoon, it is often not hung out until the following morning.